Now most apps on the iTunes store are free, the premium paid Apps which have more powerful functions still come at a price. If you've paid the price and want to download it on other ios devices. Here with Appandora Free App Installer, you are able to install any paid apps to other iPad/iPhone/iPod with just a few clicks. Appandora is a totally free App Installer and Manager for iPad users which lets users install and manage paid apps for free. There's are absolutely no charges. Now try Appandora App Installer to download paid apps to your iPad! 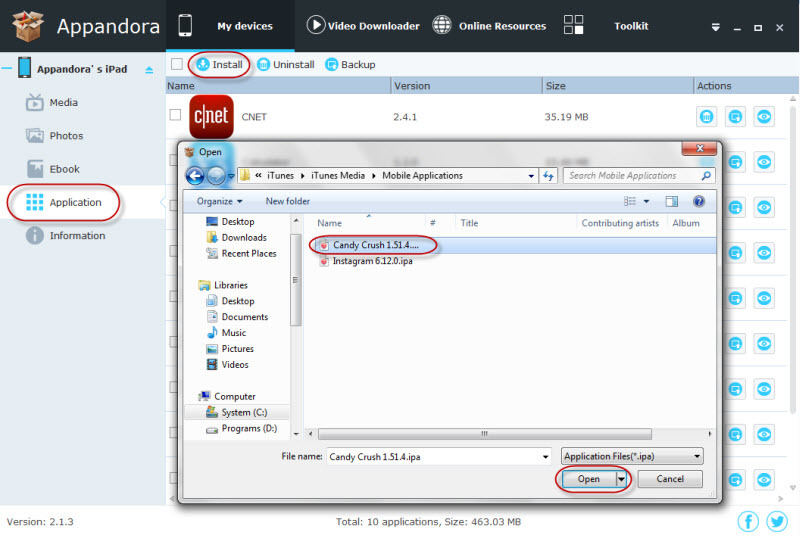 Now follow the below step by step guide to download paid apps for free on your iPad with Appandora App Installer! Now you are able to get unlimited paid apps free and simply install to your iPad with just a few clicks. Besides downloading paid apps to iPad, you can also share music, playlist, movies, TV shows, podcast, iTunes U, ringtone, ePub, PDF, audio books, camera roll, pictures, voice memos, photos, etc. between your iPhone/iPad/iPod and PC by using the free Appandora App Installer.